Our own founder and group editorial director, Wei Koh, was recently at the launch event of a special timepiece, where he found himself in the embrace of old friends, and a most blessed pinched cheek. The 28 year old tennis phenom, Rafael “Rafa” Nadal Parera, is presently chasing his 10th career title at the 114th Roland Garros (remember to catch his debut match on 26th May). 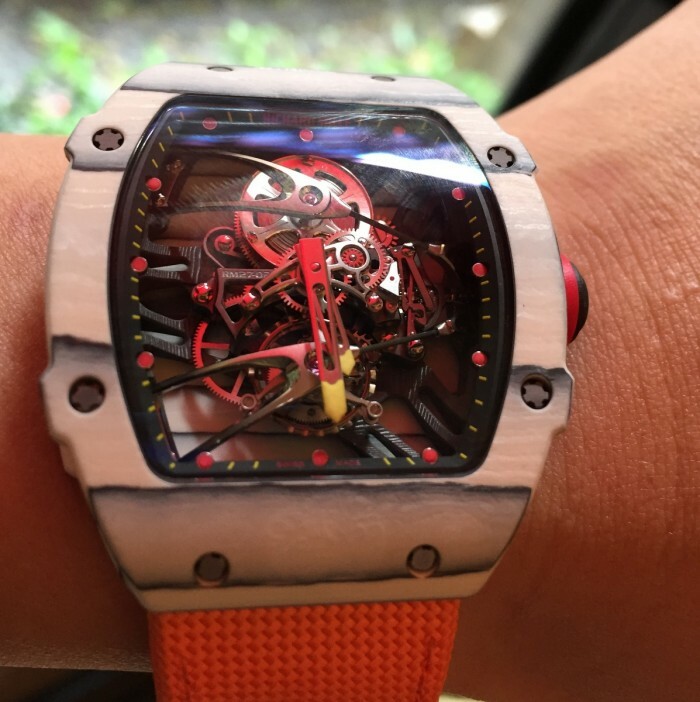 This year, to cheer on the Spaniard’s pursuit, the Swiss Jura brand has partnered up with Richard Mille to produce, what else but yet another precision tool watch capable of withstanding everything the red clay demands of Nadal. 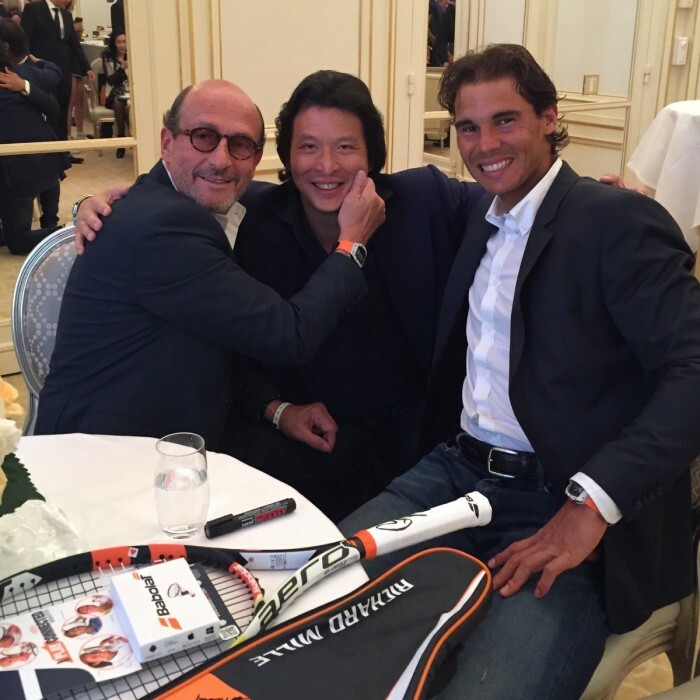 But after four, already mind-boggling Nadal inspired timepieces, one must wonder – how on earth could the mind of Richard Mille push the envelope any further? Well, here’s how: Forged from North Thin Ply Technology (NTPT)® carbon, the watch’s highly skeletonized baseplate is constructed such that its bezel and caseback are assembled directly on to it. The middle of the case has been completely done away with in what is being termed as a unibody construction method. The proprietary NTPT® carbon is not new to Richard Mille’s material palette. We’ve already seen it used in Nadal’s RM 35-01. Must’ve been a popular decision as we see it reused here in the RM 27-02. The case front and back are made from NTPT® carbon and the newly conceived TPT® Quartz. Let’s not get alarmed, the mention of quartz here has nothing to do with the watch’s movement. 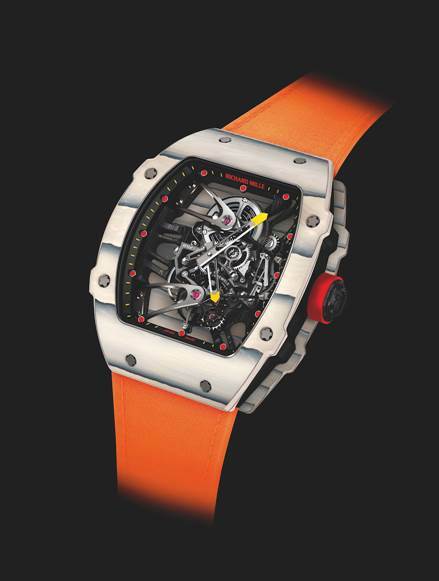 It is purely a new material that Richard Mille has developed in partnership with North Thin Ply Technology. TPT® Quartz, as it has been named, is made of over 600, 45 micron thick layers of parallel filaments, obtained by separating silica threads. When used in the RM 27-02, the TPT® Quartz is saturated in a specially developed resin and sandwiched in between NTPT® carbon layers, with each layer laid 45° to one another. 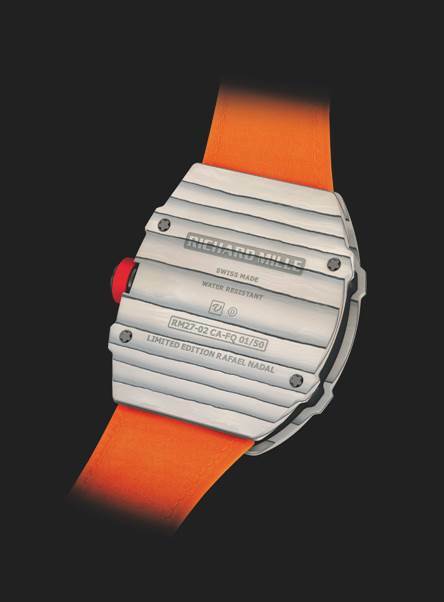 The resulting material is then CNC machined in Richard Mille’s own Proart facilities, only after unforgiving heat and pressure treatments, to produce the watch’s outer shell. Novel materials and new construction methods may be well enough worth the bragging, but Richard Mille is not one to stop there. Much remains to be spoken of within the belly of this beast. Here are some notables. We start off with something as simple as the winding barrel teeth, which in its curled profile, provides for an optimal pressure angle of 20°. This results in better rotary motion while making up for possible variations in the gear train. The watch also has a free sprung balance with variable inertia and a terminal-curve spring (Breguet overcoil, in the common tongue), that ensures time keeping accuracy even in the case of shock or disassembly. Its barrel is designed to make a complete revolution per 6 hours instead of the 7.5 hours, in order to address periodic internal mainspring adhesion. When examining the watch face itself, the first thing to beckon attention is likely the Grade 5 titanium bridges. 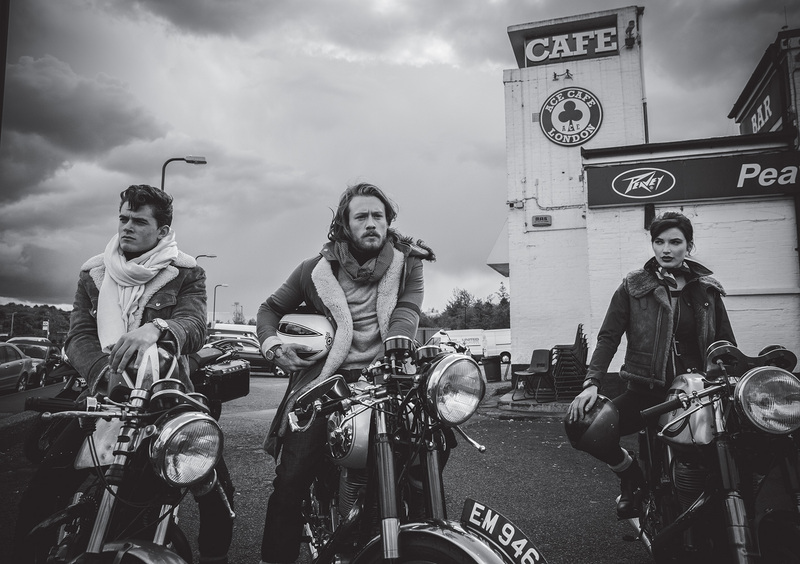 Unquestionable in the quality of their crafting and hand finishing, these are also put through vigorous stress tests to ensure their unquestionable integrity. The watch may well be a simple hour/minute timepiece with a tourbillon complication, however every execution for the realization of the RM 27-02 is one geared towards impeccable accuracy. 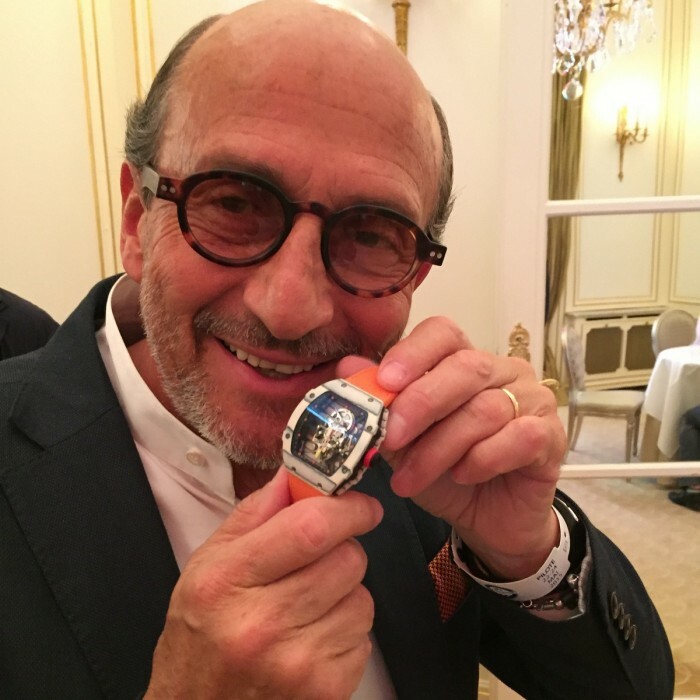 It is in fact the case in all of Richard Mille’s creations. But perhaps that too is a given, considering the extreme individuals and the extreme usages they are created for. 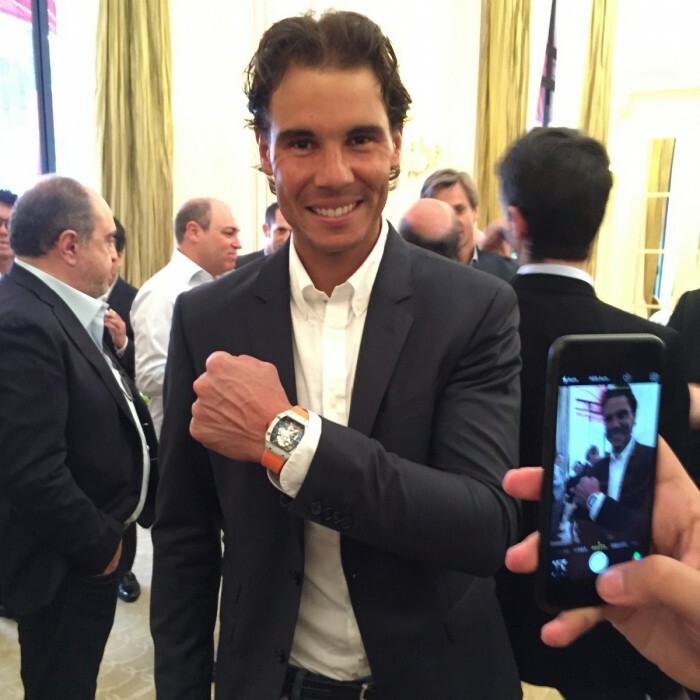 Nadal will be wearing each of the 50 pieces of the Richard Mille Tourbillon RM 27-02 Rafael Nadal, at international matches to provide the ultimate seal of quality. Although the limited run will only be made available to those closest to the brand, I imagine many of us lowly mortals will soon be dreaming of that one RM 27-02 Nadal will be wearing, if and when he emerges victorious at the 2015 Roland Garros.